Your wedding ceremony although it isn't as long as your wedding reception, it is the whole reason you and your guests are celebrating, it is where you will say your vowels, have majority of your photographs and it will be your guests first glimpse of the day to come. 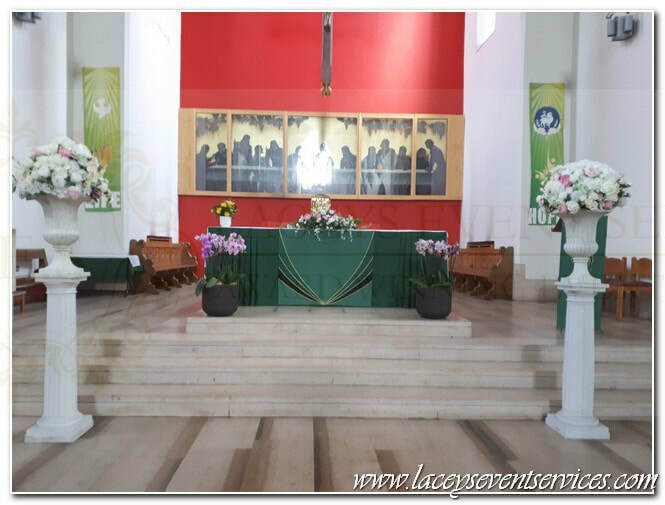 There are many ways of decorating your wedding ceremony from Aisle runners scattered with rose petals, lanterns lining your aisle, Floor standing candelabras and birdcage trees, fresh flowers arrangements adorning the tables or even on your chairs and pew ends. Always remember, it should be decorated to reflect you as a couple as it is where you will take your last steps as a maiden and first steps as a wife! 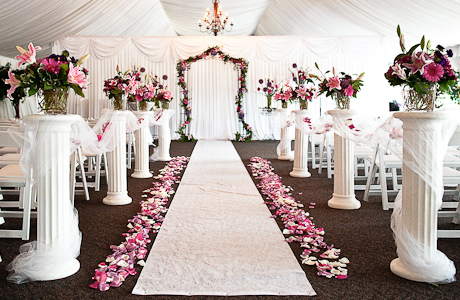 We stock Ivory, Red and Black Carpet Aisle Runners suitable for Indoor and Outdoor Use and are available in many different lengths and widths! 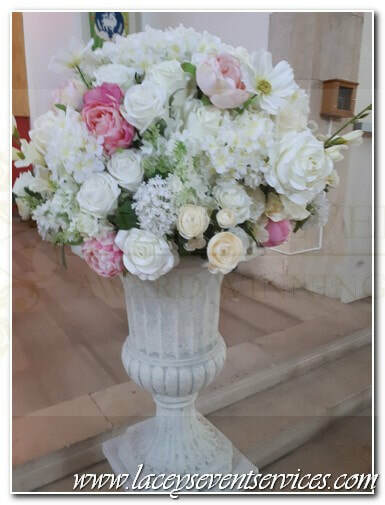 Our white wedding pillars & Roman Columns are perfect for displaying floral arrangements on for your aisle. Beautiful Romanesque Urns filled with an oversized display of life like silk flowers. Can be used on their own or with our matching pillars. Our Crystal Pedestal Urns can be used at entrance ways to a room, to line your aisle and even on tables and centrepieces. Gazebo Drapes are the perfect decor for an outdoor wedding! The soft, Elegant ceremony drapes dress an entire ceremony and make the perfect backdrop for all of your photos whilst exchanging your vows on front of your guests. 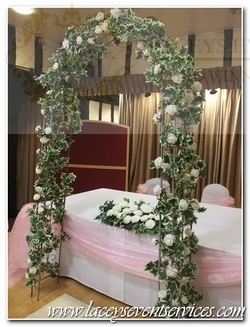 ​Beautiful artificial floral wedding archway used for wedding ceremonies and church ceremonies. Our archway stands at 8ft high and 1.8m wide adorned with artificial ivy and white summer flowers. Our shepherds crooks are a beautiful way to line pathways, walkways and even your outside aisle. They stand 1 meter high ready for you to hang your trinkets or flowers on. Bay trees, ball trees and topiary trees are a wonderful way of decorating and accentuating areas of a wedding ceremony. They look beautiful stood at the entrance of your aisle and create an equally stunning visual situated at either side of the registrar table. All of our bay trees come with ribbons and white planter pots. 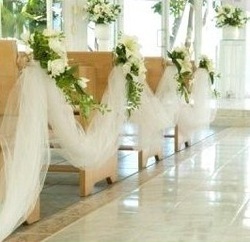 A wonderful way to adorn your aisle if you have access to the seats from both left and right. We attach an organza swag in a draped style from one chair to the next creating a visually stunning accessory to your aisle. 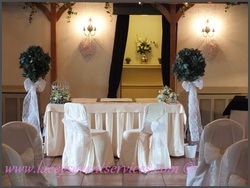 If required we can add floral décor to each of the swags for something extra special. Lanterns are a wonderful way to decorate your ceremony room and aisle. They are often placed at the end of each row of seats creating pew ends as such. 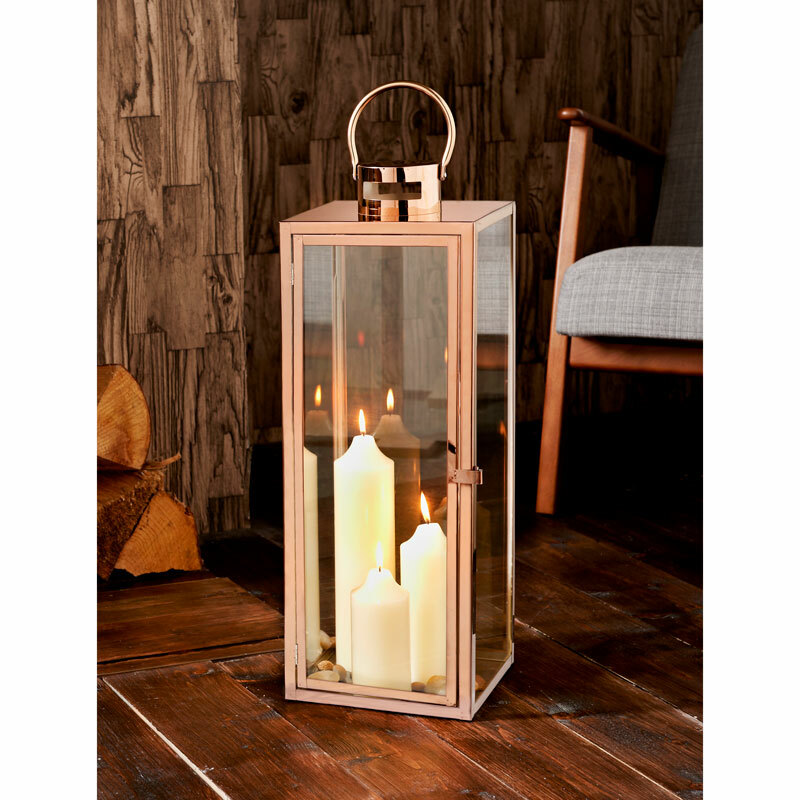 Larger lanterns can also be used scattered around the room and at entrances to set mood lighting and create ambiance. All lanterns come complete with LED candles. Our stunning 5ft foot tall floor standing silver candelabras are perfect for placing at a ceremony table, top table or around the room at a stand up event or exhibition! Our 6ft Floor Standing Ostrich Feather Displays are the perfect accessory to match your table feather centrepieces. They look great at entranceway's, each side of awards tables and High tables! Feathers available in most colours! 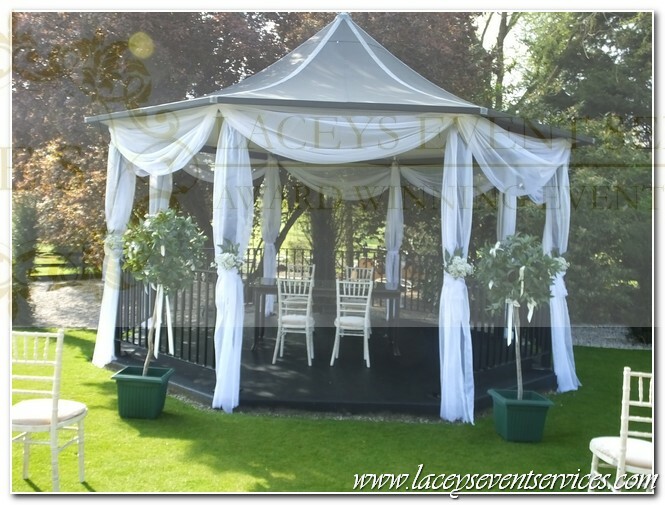 Made in house and Exclusive to Laceys Event Services Ltd you can be sure you will not find these anywhere else!